This Renaissance religious tapestry "Madonna Del Cardellino" shows he sacred work of Raffaelo (1483-1520). Here we see the Virgin Mary in a relaxed pose with a golden halo delicately behind her head. Madonna Del Cardellino means Madonna of the goldfinch, and this is a detail taken from that work. An ornate border surrounds the work. Raffaello Sanzio da Urbino, or simply Raffael, was a master artist from the High Renaissance, and with Da Vinci and Michaelangelo forms the three master artists from that time. Despite his short life, Raphael was incredibly productive and produced some of the greatest works of Western art during the Renaissance. 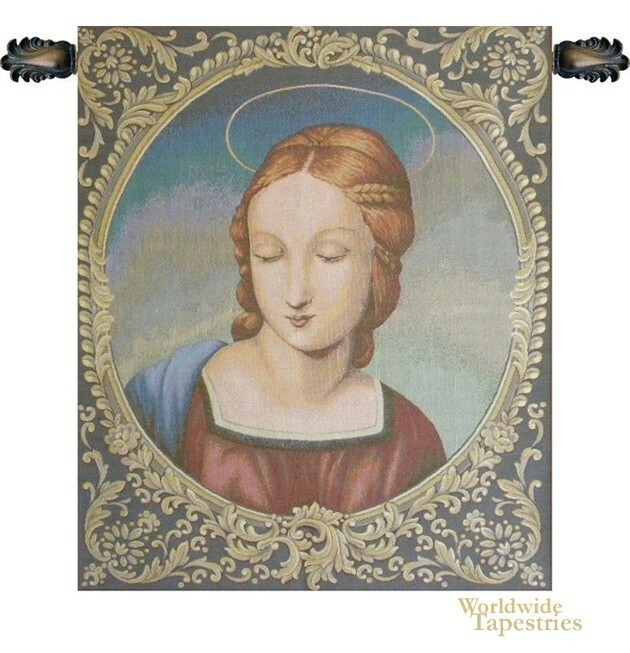 This religious tapestry "Madonna Del Cardellino" is lined and has a tunnel for easy hanging. Note: tapestry rod and tassels, where pictured, are purchased separately. Dimensions: W 18" x H 22"